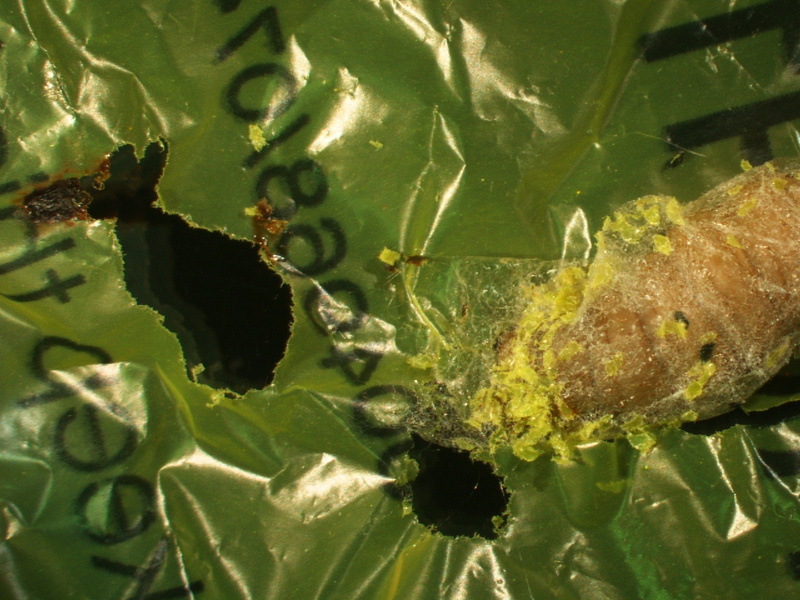 Using Caterpillar to Get Rid of Shopping Bags - Biodegrading - Something New Everyday! The wax worm, the larvae of the common insect Galleria mellonella, or greater wax moth, is a scourge of beehives across Europe. In the wild, the worms live as parasites in bee colonies. Wax moths lay their eggs inside hives where the worms hatch and grow on beeswax - hence the name. Bertocchini, from the Institute of Biomedicine and Biotechnology of Cantabria (CSIC), Spain, collaborated with colleagues Paolo Bombelli and Christopher Howe at the University of Cambridge's Department of Biochemistry to conduct a timed experiment. 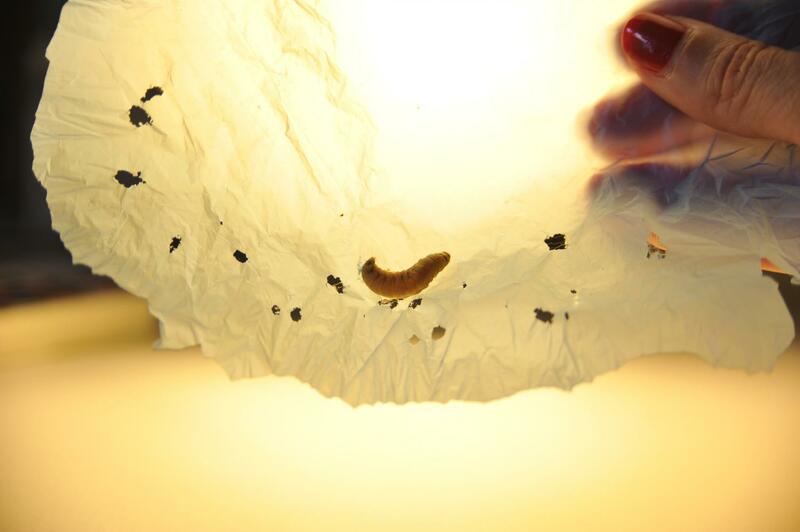 Around a hundred wax worms were exposed to a plastic bag from a UK supermarket. Holes started to appear after just 40 minutes, and after 12 hours there was a reduction in plastic mass of 92mg from the bag. Scientists say that the degradation rate is extremely fast compared to other recent discoveries, such as bacteria reported last year to biodegrade some plastics at a rate of just 0.13mg a day. "If a single enzyme is responsible for this chemical process, its reproduction on a large scale using biotechnological methods should be achievable," said Cambridge's Paolo Bombelli, first author of the study published today in the journal Current Biology. "This discovery could be an important tool for helping to get rid of the polyethylene plastic waste accumulated in landfill sites and oceans." Polyethylene is largely used in packaging, and accounts for 40% of total demand for plastic products across Europe - where up to 38% of plastic is discarded in landfills. People around the world use around a trillion plastic bags every single year. Generally speaking, plastic is highly resistant to breaking down, and even when it does the smaller pieces choke up ecosystems without degrading. The environmental toll is a heavy one. Yet nature may provide an answer. 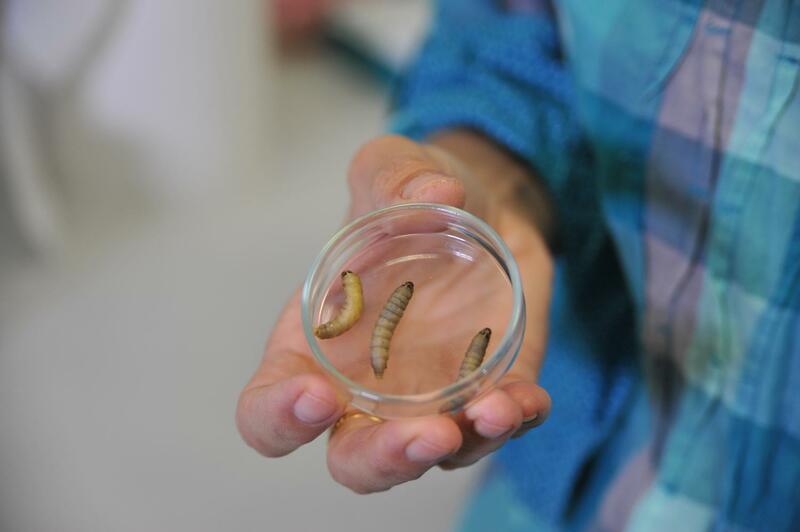 The beeswax on which wax worms grow is composed of a highly diverse mixture of lipid compounds: building block molecules of living cells, including fats, oils and some hormones. While the molecular detail of wax biodegradation requires further investigation, the researchers say it is likely that digesting beeswax and polyethylene involves breaking similar types of chemical bonds. "Wax is a polymer, a sort of 'natural plastic,' and has a chemical structure not dissimilar to polyethylene," said CSIC's Bertocchini, the study's lead author. The researchers conducted spectroscopic analysis to show the chemical bonds in the plastic were breaking. The analysis showed the worms transformed the polyethylene into ethylene glycol, representing un-bonded 'monomer' molecules. 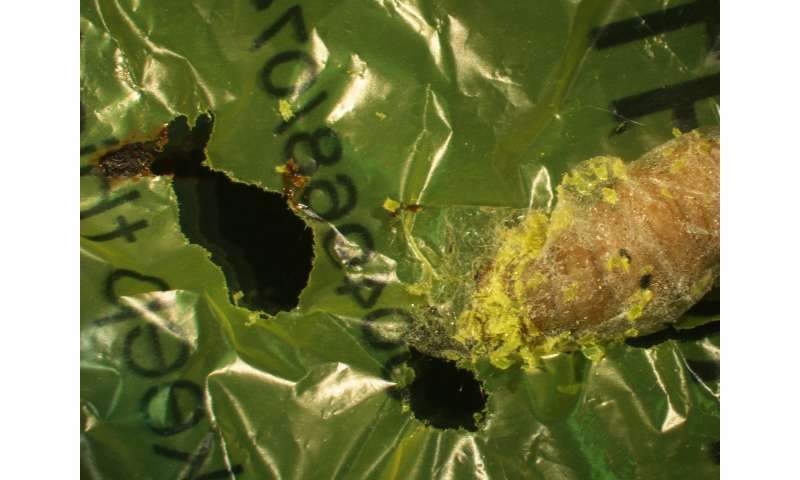 To confirm it wasn't just the chewing mechanism of the caterpillars degrading the plastic, the team mashed up some of the worms and smeared them on polyethylene bags, with similar results. 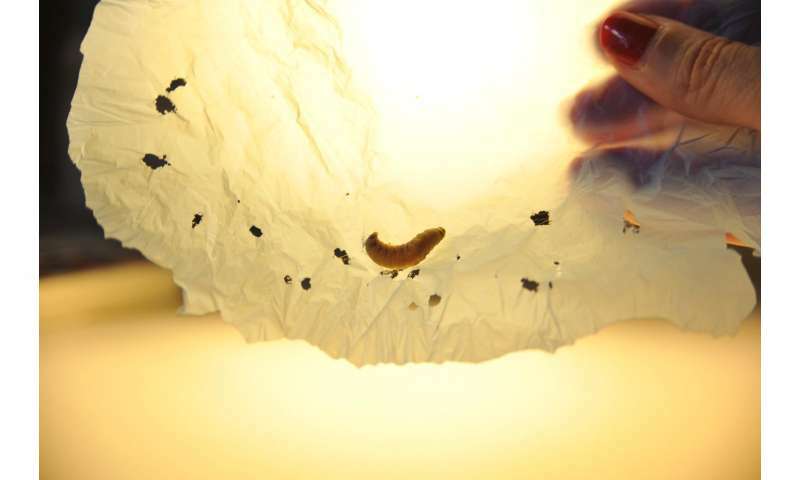 "The caterpillars are not just eating the plastic without modifying its chemical make-up. 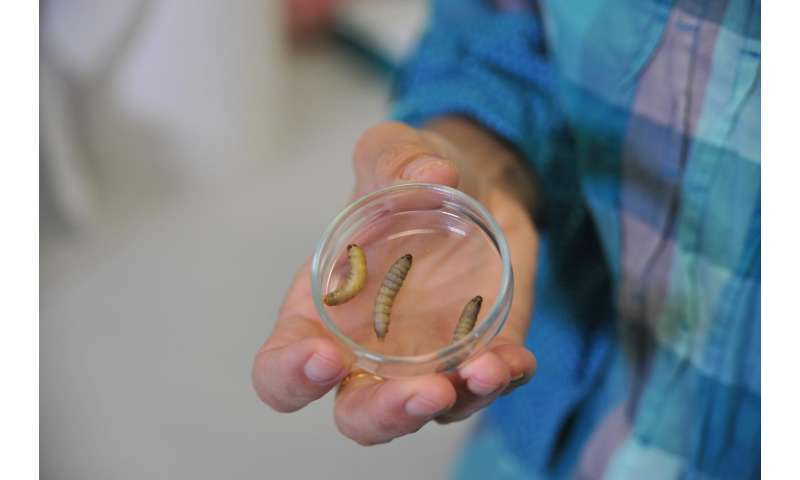 We showed that the polymer chains in polyethylene plastic are actually broken by the wax worms," said Bombelli. "The caterpillar produces something that breaks the chemical bond, perhaps in its salivary glands or a symbiotic bacteria in its gut. The next steps for us will be to try and identify the molecular processes in this reaction and see if we can isolate the enzyme responsible." As the molecular details of the process become known, the researchers say it could be used to devise a biotechnological solution on an industrial scale for managing polyethylene waste.